of earth and her two legged travelers. 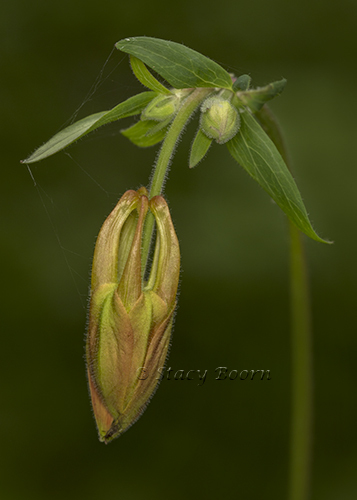 Returning to a familiar location can often pay off especially if the changing weather disrupts a predictable bloom. That was the case for me when finding a few wild columbines blooming at mile marker 12.43 on the Fairfax-Bolinas road heading toward Stinson Beach. This road was closed for two months due to multiple landslides caused by our torrential rains and it looked like these plants would only be blooming out of sight of human visitors. Wild Columbines are difficult to photograph because their stems are so thin and long that even the gentlest of breezes will set the flower in rapid motion. Using a flash can help greatly so that you have a fast enough shutter speed to freeze the motion caused by the breeze. This way you don’t have to shoot wide open which gives you very little depth-of-field. Better to let the background go dark, due to the distance the flash is able to land on, than to have a blurry image. In fact I like a black background occasionally with a wild flower. The root of the name columbine, Columba is Latin and means dove. 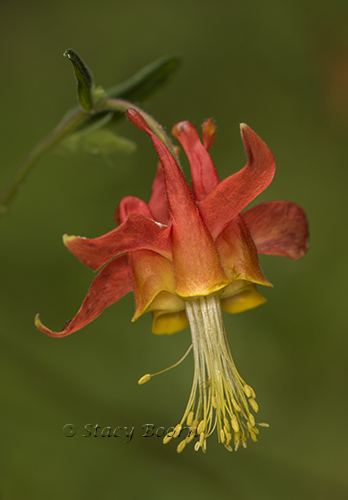 But the columbine’s proper Latin name is Aquilegia which translates to mean eagle. 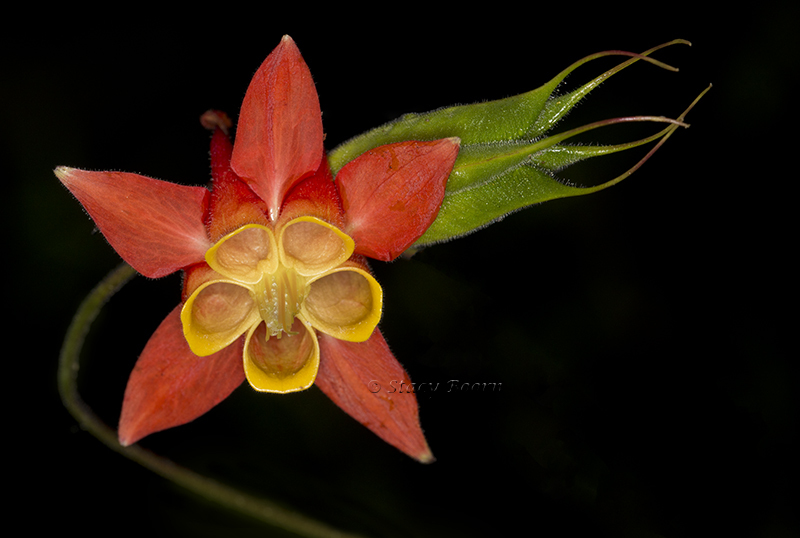 It was so named because the spurs of this flower reminded some observers of the talons of an eagle, and like the eagle the columbine has evolved to survive perfectly in its diverse environments whether it be southwestern United States, the hillsides of Marin or the mountainsides of Colorado. Receive the wisdom of the columbine: Wherever your journey takes you stay steadfast in your faith, love and friendships. Believe in things that are not yet seen. The Celtics believed in the world of dreams and visions and that columbines were the portal to this world. It began with a simple four-letter word: LOVE! In the 1960s this word became synonymous with a generation and then the city of San Francisco. It was an achievable ideal, a belief deep in the hearts and souls of all who were there (and those who were there in spirit…even years afterwards). The website for the 50th Summer of Love is reporting: The original 50th Summer of Love permit for June 4th has been denied. As directed by the Park Commission we are applying for a new permit for: September or October at Sharon Meadows Golden Gate Park, SF. Hopefully this application will move smoothly. We apologize to you for any inconvenience this may have caused. Hummmmmm ?????? Nonetheless bloom with orange-gold smiles! 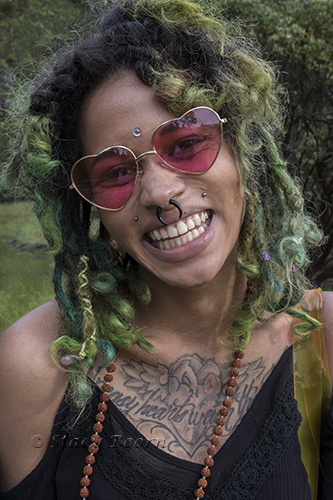 This entry was posted in Uncategorized, Weekly 2 and tagged Columbine, Fairfax-Bolinas Road, Nature Photography, Stacy Boorn, Summer of Love, Wild columbine, wildflowers. Bookmark the permalink.